This third book opens with the Percy/Annabeth reunion I felt cheated of in Book 2, so that was a good way to begin the story! The Greek and Roman heroes of the first two books are finally united here, to set off in their flying ship, the Argo II, towards the ancient lands of Rome and Greece. This will be the battleground to try to stop the waking of Gaea, a very unmotherly Mother Earth who wants to destroy humanity. Obstacles come thick and fast, from tensions within the group and from monsters at every turn. Besides being happy about the reunion, I was particularly happy to see Annabeth in a much larger role in this book. A daughter of Athena, she’s smart and capable and a good leader, who got a little overshadowed in the Percy Jackson books (think Hermione) and had only a small part in the first two books of this series. We finally get to see into Annabeth’s point of view, and get new insights into her love of knowledge, her fears and insecurities, and her feelings for Percy. I like smart, capable, mature-for-their-age female characters. Again–think Hermione. Although just to clarify, Annabeth is a similar but unique character! I was a little less happy to see that Riordan was trying to juggle seven (count ’em) major characters in here…but he actually kept the balls in the air pretty well. Jason faded a bit and I occasionally had to remind myself–Hazel, daughter of Pluto; Piper, daughter of Aphrodite–but I didn’t actually get confused, or feel like I was missing any character’s POV too often. It may have helped that Percy and Annabeth were my favorites, and they seemed to get the most focus. Leo is also a lot of fun in here, both with his usual comic sarcasm (there’s a particularly good moment with Leo competing with Narcissus…) and with some new depth about his insecurities. He worries about pulling his weight (or even actively messing up) on the quest, and also, with all six other characters paired off, he has a very natural fear of being a seventh wheel. Riordan has three romances in play here, and does a nice job making each romance unique. All three couples have some relationship things to work out, but it’s different things. And even though that sounds like a lot of drama, it doesn’t distract from the larger, world-saving problems they’re facing. Though we get some nice romantic moments in there too. Riordan also continues his masterful touch of keeping a long string of fights with various monsters interesting and not at all repetitive. With different monsters and different methods for fighting them, each fight stays unique. And even as the challenges grow darker, there are still nice injections of humor throughout. Also, points for getting his Greek/Roman myth details correct. There was about a page in here where I really thought he was going to say that Hercules was Greek…which, yes, everyone does, but when the whole series is built around the difference between Greek and Roman myths, I wasn’t willing to let it pass this time. Heracles is Greek, Hercules is the Roman name. AND–Riordan addresses that and gets the details right. Awesomeness. And even though I have a huge, childhood-based soft spot for Hercules, I was willing to go along with Riordan’s conceited jerk version. The book ends with an (almost literal) cliffhanger, so I’ll be hurrying along to Book Four, The House of Hades. And really, it’s a good cliffhanger, one that makes me excited for the next chapter of the adventure! 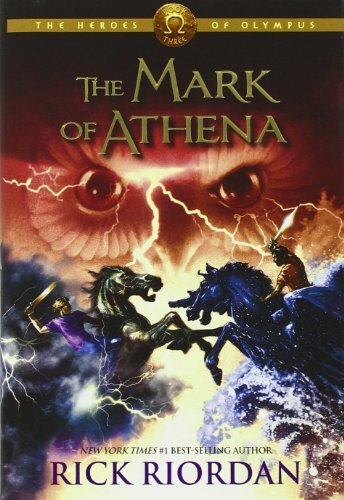 Almost done with Riordan’s Greek series, so I’m glad to hear that when I finish this series I won’t have to stop reading good stories about Percy’s adventures with mythological figures. It’s also to hear that Annabeth will be back, even if belatedly. And big bonus points to Riordan for getting the whole Heracles v. Hercules thing right.